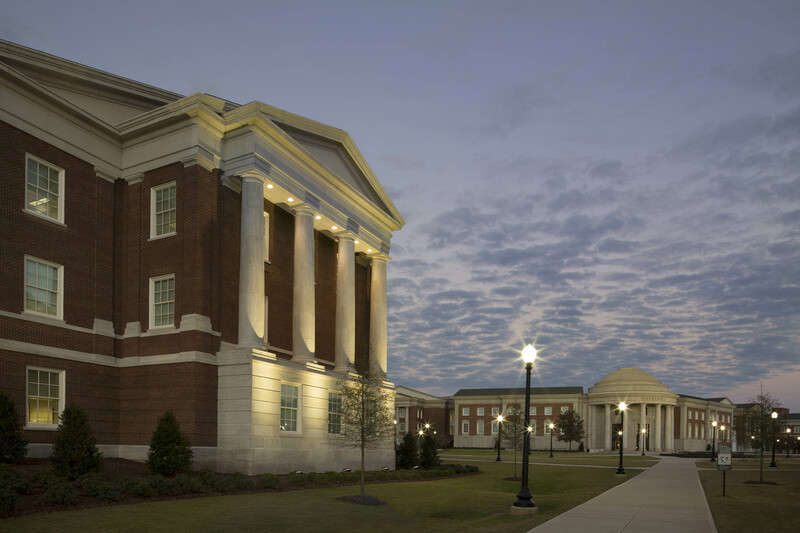 Located at the northwest corner of the University of Alabama campus, the $58 million Science & Engineering Phase IV facility is the 4th phase in over $300 million in Science & Engineering development constructed on the campus over the past decade. The Phase IV facility provides approximately 205,000 net square feet of research and instructional laboratories, research support amenities, faculty offices, graduate student workstations, conference/meeting facilities and collaboration spaces. The focus of research serves five areas of ongoing research at the University. These research ‘thrusts’ are: composite and nanocomposite materials, tribology, surfaces; coatings and corrosion; materials processing, manufacturing and joining; electronic, magnetic and photonic sensors; and structural characterization. The SEC Phase IV facility houses over 70 separate research laboratories in support of the faculty working in these specialized areas of study. In accordance with the overall research and teaching mission, Phase IV also supports the campus by providing a centralized campus Cleanroom facility. The 7,800 sf Cleanroom meets ISO 5, 6 & 7 Cleanliness classifications and includes one class 100 bay & two class 1,000 bays. As one of the largest university cleanrooms in the United States, the facility is prominently located on the main floor of the building adjacent to a dramatic four-story classical lobby atrium. The project was designed to include an approximately 10,000sf Central Analytical Facility located below grade to provide an ultra-quiet, low vibration space to house several world-class electron microscopes. As part of a value engineering process requested by UA, the CAF was constructed as a shell waiting future fit-out with all vibration & shielding requirements incorporated. A key goal of the SEC Phase IV project was to create flexible research environments, including labs and core lab areas that can grow and change easily over time. The ability to accommodate new research tools and equipment without major disruptions of the ongoing operations and/or investment of major costs is a key objective of the project. Building Information Modeling (BIM) technology was integral to this project and the Doster BIM Model has been regarded as the most sophisticated BIM construction model produced in the southeastern United States at the time of construction.